I am beginning to get a complex thanks to Pinterest. Apparently every woman except me has a recipe binder, feeds a family of 4 for 100 dollars a month, and keeps their house clean with only 15 minutes of work a day. I am lucky if I can find the recipe I am following for the day, I don't even want to talk about my grocery budget (how much milk can two boys possibly drink! ), and I laugh at the idea of cleaning only 15 minutes a day. That's hilarious, I clean pretty much from the time I get up until I go to bed, no joke. Most days I feel pretty good about myself, until I step foot on the internet, then it all comes quickly crumbling down. I am so jealous of people that can keep their house clean and keep their food budget down. I do reasonably well for a family of four with our food budget. However, we don't buy anything pre-packaged and gluten free flours are crazy expensive. Plus I really need to get my two boys to stop eating all day, that would save a ton of money (obviously I'm kidding, mostly). At least my food normally looks half way decent and no one complains that it tastes bad, that counts for something right? While most people stop making soups in the summer, I'm a little abnormal. I make soup year round, I love warm soup in warm weather. I blame my grandmother who was determined hot coffee in the summer made you cool down (don't worry I know this isn't actually true). 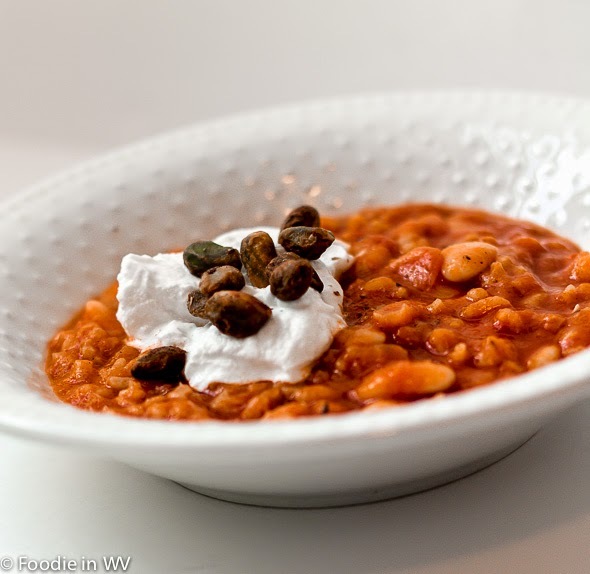 Last week I tried a new recipe for Spiced Fava Bean Soup with Rice and Tomato from the April 2014 of Bon Appetit Magazine. This recipe has 14 ingredients. It takes an hour of total time, all of which is active, and makes 6 servings. I made a number of changes to the original recipe. First, I used long grain brown rice. It was what I had in the cupboard and I didn't want to have to buy more rice. I have never actually seen dried fava bean in my area, so I used lima beans instead. I allowed the lima beans to soak overnight in order for them to be soft enough cooked in the recipe, I hate half cooked beans. Finally, for the broth I used homemade veggie broth. I love making homemade vegetable stock, you can literally throw in whatever old veggies you have in the fridge and let them simmer for a couple of hours. Much, much, cheaper than store bought. My soup came out thicker than the magazine recipe. It was more of a stew than a soup. However, the flavor was delicious and it was a nice way to get my family to eat a vegetarian meal. Best of all there were enough leftover for two lunches for my husband for the week so it was economical. He's slowly coming around to eating more vegetarian meals, slowly. 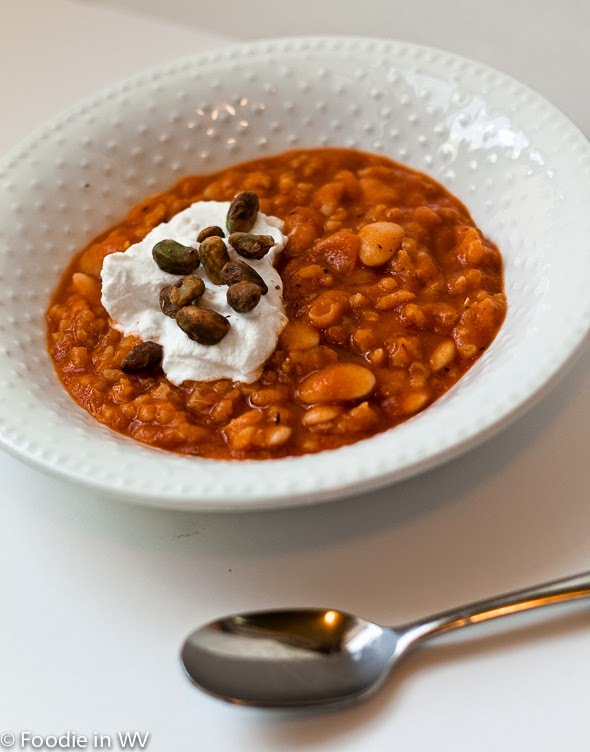 For the recipe go to Spiced Fava Bean Soup. My grocery budget is off the charts. We both have 2 growing boys, so how can you possibly stick to a budget on that? I totally agree! My two boys eat and drink a ton :) It's a losing battle for sure! As long as the AC is on I can also eat soup any time of year! As long as it's tasty I'll eat it. ...I like your stew-soup very much. The thicker the better, most of the time. Beautiful shots...and that white bowl. I like my soups thick as well. A hearty soup is yummy year round! I'm glad you substituted limas for the lava beans because that is what I will have to do too. Don't feel bad…there is no way I can clean my house in 15 minutes each day either. I've never seen fava beans here. Lima beans are super easy to find though! Thanks :) It turned out really delicious! Looks delicious! I make soups year-round too. Twice already this week! I made a vegetable-barley soup on Monday and a carrot-lentil one last night. It was 100 degrees every afternoon this week but it didn't stop my soup-love. :) I agree with you about Pinterest; I have an account but I can only take it in very small doses. I made two soups last week too :) I love that I can make a big batch of soup and then have all the leftovers to eat for lunches during the rest of the week! I like soup year round too. Our grocery bill's not so high with the two big boys grown and moved out, but it's high from my husband's supplements. He's got a regular pharmacy going on in his medicine cabinet, and that 'ain't' cheap. Supplements can cost a fortune! I know just vitamins for my husband and I can add up. I have to take iron though since mine can get pretty low without a supplement.